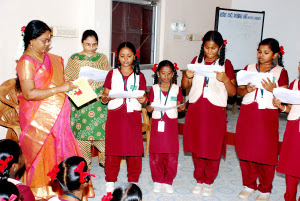 Srividya Suryanarayanan writes about the two storytelling sessions she conducted in Chennai. I have been linked with Pratham Books from my Creative Remixes days. I had used their ‘Creative Common’ images to create an original story. So I was not unfamiliar with the organization but Champions Programme was new for me. 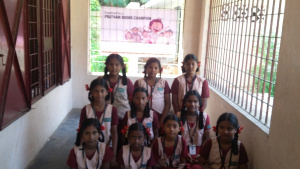 Pratham has been creating awareness and exposure to this programme through their twitter and facebook social media spaces. The organization aims to increase readership among children for the International Literacy day falling on the 8th of September 2015. This year’s programme was flagged off on Teacher’s Day 5th September to bring more children towards reading books. It had special connotation because the teachers bring the world of books and knowledge to a child in their unique ways. I got to know about the Champions Programme from my co-worker Anitha Selvanathan. 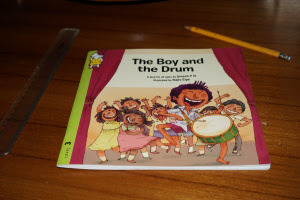 This year’s featured book was “The Boy and the Drum” by Umesh P N and Illustrated by Rajiv Eipe. Even though I registered for the drive of getting books to children to inculcate reading habits, I was rather excited and felt a little challenged. I am crazy about books and if I can generate interest among children for reading then the very sharing is a reward by itself. 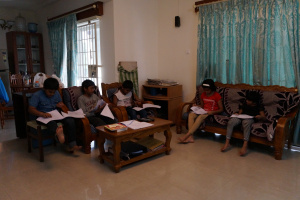 I had planned on having a Reading session in my house for my home tuition students. But something kept egging me to seek out a bigger challenge. I wanted to share it among a larger audience since I was equally passionate about sharing a story. Quite by accident, actually, I came across the Government Girls Higher Secondary School (GGHSS), Ashok Nagar, Chennai. I approached the Headmistress Mrs. R. C. Saraswathi who felt strongly about encouraging reading habits in children. She immediately linked me up with the Drama teacher K. S. Latha who had been a great source of help for smoothing my way for the reading drive. The school was closed for the Teacher’s Day and so we scheduled to have the reading session a day earlier on 4th September at the school. On the D-Day, I was conscious of the enormity of my challenge but I was also happy to bring them a story to enjoy reading. The Drama teacher offered to set aside two periods for the reading and enacting session. I was able to prep-talk the children on how to read the text without the stage instruction. The Drama teacher added in her spicy instruction to make the play alive. The selected 10 Children read the story first as a practice and then as a finale. The children were spirited about the reading session each trying to out-do the other in making the play come alive and giving it their touch of unique interpretation. We had a discussion session after the reading to further understand and gain insights into the story. The Children showed such enthusiasm towards being exposed to reading that they felt an annual event would be a long wait for them. They gave me the inspiration to take these sessions to more children and give them the gift of reading and to explore stories with their imagination. I enjoy making the children desire befriending a book, because one gains a friend who would remain an inspiration through all seasons of life. The One Day One Story drive was the first step towards a long journey ahead. For there is nothing as rewarding as watching those sparkle in the eyes of the children who have just finished reading a story and have found enjoyment in it. Thank you Srividya for spreading the joy of reading! In its fourth edition of the 'One Day - One Story' campaign, Pratham Books was joined by 2500+ storytellers who conducted 2300+ storytelling sessions. Many, many steps towards a 'Reading India'! View more pictures from the International Literacy Day Celebrations held in 2015. This blog contains stories sent in by all our champions. Browse through the blog for more stories. You can also go through the tags on the right side of the blog to find stories happening in your own city.